Build AI-rich voice & text based conversational interfaces. We help customers build enterprise-class chat bots and intelligent interfaces for the brands & websites. We are also partnering with startups to build chat-first business models. Multi-channel approaches are critical for all businesses. You need to be present wherever your customers are. We have developed bots that support a variety of messaging and voice interfaces. We love developing for Slack platform in the enterprise domain. We are also building exciting voice-tech solutions that leverage machine learning APIs for speech-to-text and analytics. 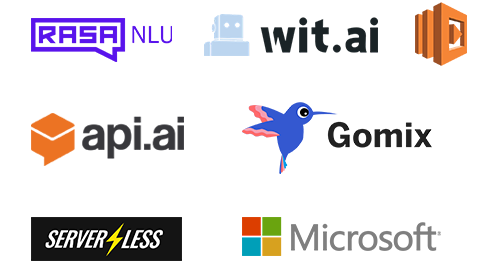 We have developed chatbots using most of the popular chatbot frameworks from AWS, Microsoft & Google clouds. Botkit is a popular framework when you do not want to host on a public cloud. Our strong Node.js expertise and experience integrating with various libraries and third party APIs makes us an ideal partner. Our machine learning team has expertise with NLP technologies and deep learning algorithms. We leverage popular cloud services for NLP as well as Rasa NLU for private deployments. We can also use AWS Lambda, Gomix or similar serverless frameworks to build your chatbot infrastructure so that it is infinitely scalable. Personal assistants, productivity tools, Robotic Process Automation (RPA), actionable insights and collaboration. Shopping assistants that take customer experience to a new level on your digital platforms. Find stores, recommendations & personalize journeys. Always available customer service and support on all channels. Automate and augment your support team functions. Patient experience that surpasses all expectations through primary care bots: reminders, pre-visit preps & conversational care. We can help you to build intelligent voice and text conversational bots within 30 days.